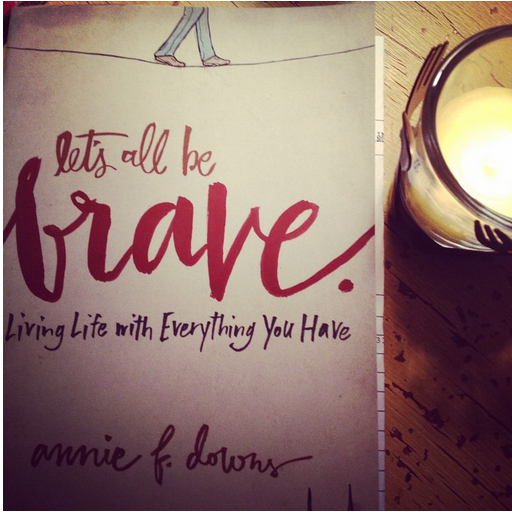 I really wanted to love this book by blogger Annie F. Downs. It's the first book of hers I've read, and I loved the concept and title. I NEED more bravery in my life right now! And I know several good friends who really enjoyed this book. So I was disappointed when I found this book to be lackluster from the very beginning. It was far too personal, as the entire book was simply "essays" about times in her life (some random examples, I thought) of when Annie tried to be brave, that were confusing, muddy, and convoluted to the uninitiated reader (i.e. anyone who is not very close to the author). I felt that this book tried too hard to be hipster by including the coffee shop where each piece was written. The pieces were not chronological, which made following Annie's travels and stories confusing. The stories were more like mini therapy sessions for the author, in my mind, with a,"So be brave! Like I sorta was!" at the end of each "chapter." Not what I was looking for. The writing style was also far too young for me, very adolescent-oriented and not quite deep enough for the subject matter. The sentence structure was very stylistic. That might suit others just fine, but it just didn't jive for me. I also found it disconcerting that Annie talked about the writing process a lot, making reference to the fact that she was writing a book, and in one or more cases, spending at least a whole page talking about how nervous she was to be writing what we were going to be reading on the next few pages. Bravery? Maybe. Good reading? Not in my book (ha, a book pun, get it?). Sorry Annie and friends, I really am. But this one only gets 1 star from me.